Niobrara's PMEUCM Universal Communications Module is a programmable serial/Ethernet communication modules for Schneider Electric's M580 ePAC. It includes two serial ports, two bottom pannel mounted 100BaseTX Ethernet ports, a PLC Ethernet interface, a LCD display with joystick, a real-time clock, a TCP/IP stack, and a MicroSD card slot. Read data from external devices and/or the ePAC. Allow external devices and/or the ePAC to write data to the UCM. Both the PLC and external devices can read the gathered data. Time-stamp data for later retrieval. Allow devices with different protocols on separate ports to communicate. Non-Modbus devices and read/write the PMEUCM or the PAC. Send and receive e-mails for alarm conditions. Access device data and configure setup parameters with a web page. Allow Ethernet clients to access PLC and serial slaves. 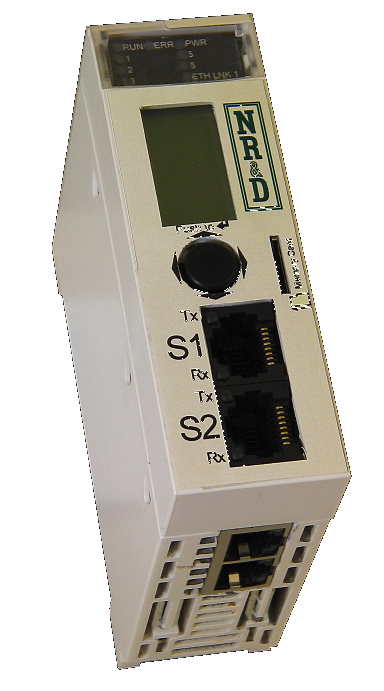 Allow serial master to access PLC and Ethernet servers. Interfacing Modbus RTU master to an Allen Bradley® DF1 device. Interfacing Modbus RTU master to ENRON/Daniel Modbus Slaves. Gathering data from Simpson Hawk® meters for the Quantum PLC. The source code for these applications is available here. The applications can be used as is or modified to solve your PLC communication problem or used as examples to start your own QUCM application development. The UCM is programmed via Niobrara's UCM language. This structured text language has a BASIC-like structure which makes it easy to read and follow. Powerful language extensions for data communications and PLC interfacing make it ideal for use as a PLC communication language. A TCP/IP stack is built in, making it easy to write application layer protocols using TCP/IP, UDP/IP, and PPP. The language is compiled for the fastest possible execution. The compiler is included at no extra charge. Although the PMEUCM is designed for user programming, many companies choose to have Niobrara write their UCM code. Contact Niobrara for a quote. The QUCM can run a single application with up to 64 parallel threads. All threads have access to the ePAC backplane, the serial ports, the LCD display, the real-time clock, the TCP/IP stack, and the internal registers. The PMEUCM0302 has serial ports 1 and 2 as RS-232. They use Modicon's pinouts, so standard cables work well. The PMEUCM0312 has serial ports 1 and 2 as 2-wire isolated RS-485. They use removable connectors that are included. The 100BaseTX RJ45 Ethernet port defaults to Modbus/TCP protocol. The UCM has a TCP/IP stack which the user's application can access for easy implementation of various application layer protocols. Several application layer protocols have been implemented; examples are available online. A custom DTM for each application is generated to allow the ePAC to configure the PMEUCM over the Ethernet backplane. The QUCM has a high resolution LCD display under application control. It also has a 5 position joystick that may be read by the application. A real-time clock is available to the applications and is especially useful for scheduling events or time-stamping data. To connect PC COM: port to the PMEUCM use an MM1 cable. For optically isolated RS-485 use the DDC2I. * PMEUCM0302 with two RS-232 ports and two 100BaseT Ethernet ports. * PMEUCM0312 with two isolated two-wire RS-485 ports and two 100BaseT Ethernet ports. Warranty / Manual: The QUCM is furnished with a user manual on cd and carries a one year warranty from the date of shipment. During the warranty period, free firmware upgrades are available. See Niobrara's Standard Terms and Conditions of Sale for additional warranty information. Dimensions: Standard Quantum register module. 1.59" wide by 9.84" tall by 4.09" deep (40 x 250 x104mm). Approximately 12 oz. (340 g.) net. All connectors and indicators are front mounted except the Quantum bus card edge connector on the back. Power Requirements: From Quantum bus; 5 VDC, 550 mA max (350 mA typical). Operating Conditions: 0 to 60 degrees C; humidity up to 90% noncondensing; pressure altitude -200 to +10,000 feet MSL. Serial Ports: 0302: RJ45 RS-232 data I/O ports. 0312: Isolated removable connector RS-485 ports. 50 - 38400 baud. 7 or 8 data bits; odd, even or no parity; 1 or 2 stop bits. Indicators: LED indicators for Module Active, Ready, Run, Fault, RN1 (application running), RN2 (auto-transfer running); Ethernet Transmit, Receive, Link, Collision; Serial Port Transmit (2), Receive (2). 24 total indicators. 10 user controlled LEDs. * Schneider Automation holds a patent for serving web pages from a PLC. If the QUCM is used to serve web pages from the Quantum PLC a license is required. This license is available from NR&D at additional cost or from Schneider Automation. Effective 31 March 2017 - Specifications subject to change without notice.